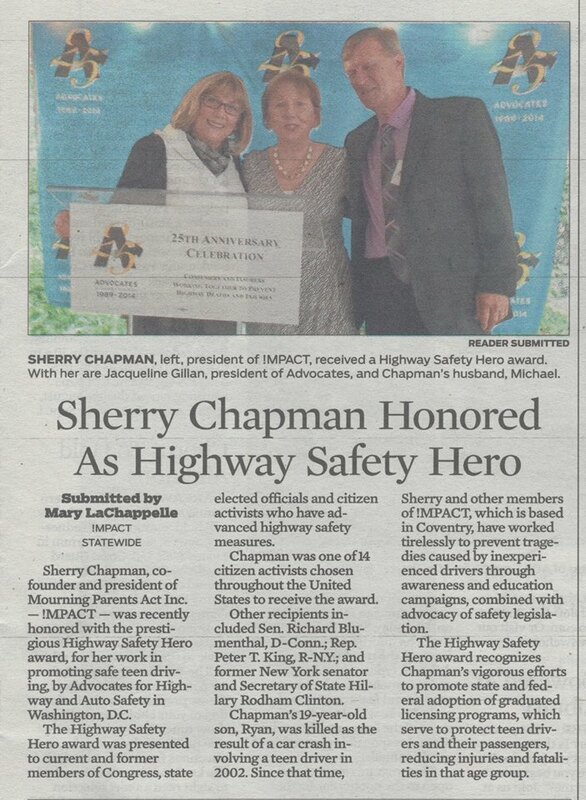 In December of 2002, Sherry Chapman's 19-year-old son Ryan was killed when the car in which he was riding as a passenger crashed in Hebron, Connecticut. Since Ryan's death, Sherry has become a tireless advocate for teen driving safety. Sherry is co-founder of the non-profit organization, Mourning Parents Act, Inc., also known as !MPACT. The mission of !MPACT is to eliminate tragedies caused by inexperienced drivers through awareness, education and legislation. Sherry also founded Ryan's Memorial Fund, a 501(c)(3) non-profit organization committed to serving the needs of the community in tribute to the life of Ryan. Sherry serves as an advisory board member of a number organizations that promote safe teen driving and health and safety generally. For a current list of Sherry's affiliations, click here. Sherry is writing a memoir with the working title, Unfathomable Loss: a mother's grief journey.